Pumping Station for the Job. > Call Today <..
For the majority of basement waterproofing, the sump pump is crucial to eliminating water before it can build up and cause a flood. Therefore, it’s important to know that your sump pump is reliable, automatic – and that it has a backup solution in place, in case of a power failure or mechanical problem which might cause the primary pump to fail. 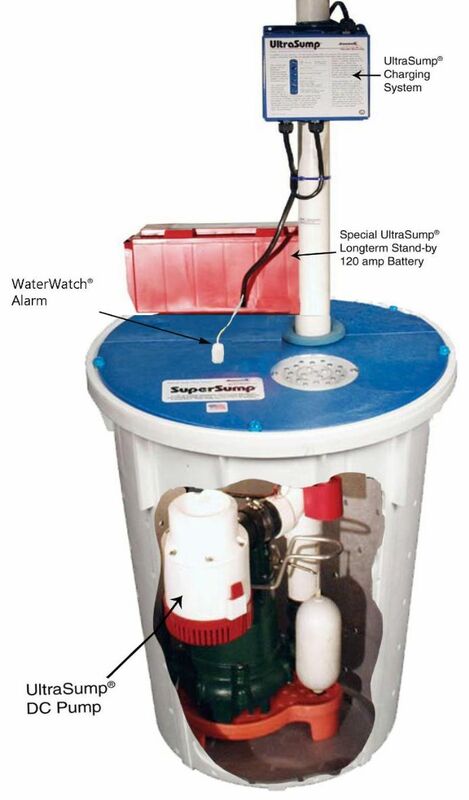 In comparison to many sumps, which are little more than holes in the ground, the SuperSump pump system features a complete package of sturdy, sealed polyethylene tank, an airtight lid able to drain water away without allowing air or gasses to escape from the sump, and one of the most reliable, powerful sump pumps on the market – all supported by a completely redundant pump system which includes an independent battery power source, float switch and pump, so you can rest easy knowing that your sump pump situation is taken care of. Lastly, a WaterWatch Alarm System is included, able to detect when the water level has risen too high and sound an alarm, giving operators the advance warning they need to take action in the extremely unlikely event of system failure and further reducing the likelihood of flood damage. 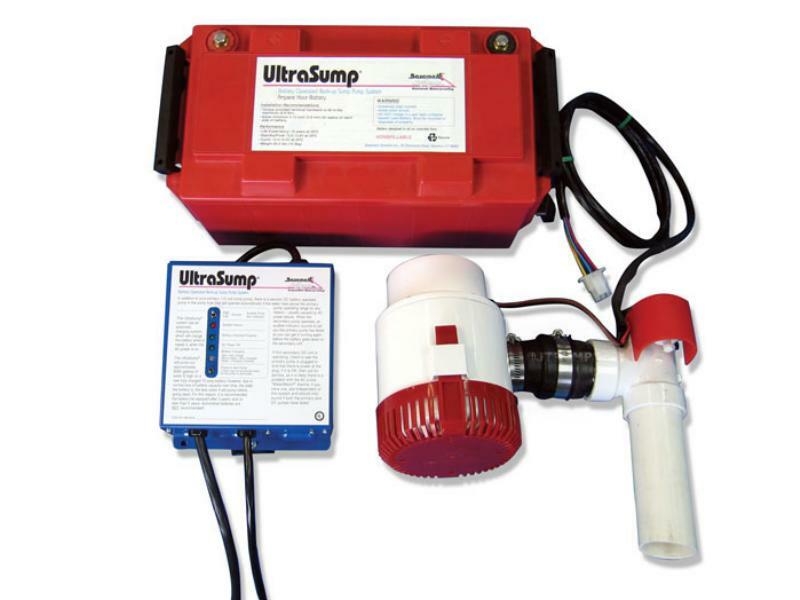 The SuperSump, paired with the UltraSump backup system and Waterwatch Alarm is one of the most reliable, dependable basement sump pump systems available, and JT Pumps are delighted to be able to provide these industry-leading systems to our customers. The pumps used in the SuperSump pumping station and its backup counterpart, the UltraSump, are some of the most reliable, compact and powerful pumps on the market. 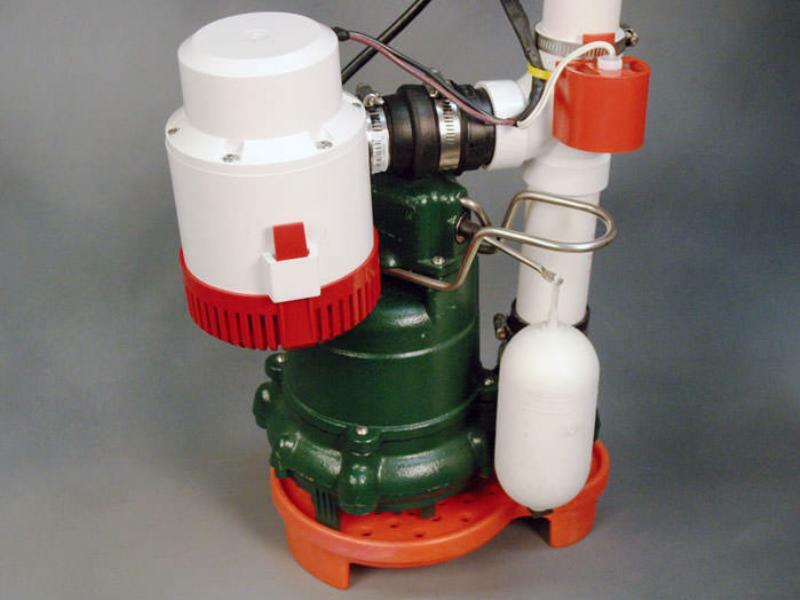 The SuperSump’s pump, a cast-iron, 1/3 hp Zoeller pump, is equipped with a mechanical float switch, which turns it on automatically once the water reaches a high enough point. Chosen from over 50 potential pumps to fit this system, the Zoeller pump is made from sturdy, durable cast iron, and is able to pump 2650 gallons (10,031L) of water per hour, and can even handle half-inch solids without clogging. To make a blockage or problem even less likely, the Zoeller pump is mounted on a Clean Pump stand, keeping its water intakes out of reach of any silt or sediment that may be carried into the tank by floodwaters. Not only is the cast-iron Zoeller SuperSump pump a powerful, reliable bit of machinery, but it is also quiet and smooth, with two additional rubber fittings attached to the discharge line, further reducing noise or vibration from the pump. Larger, more powerful pumps with a higher capacity can be fitted to the SuperSump system if you need them – just let the team at JT Pumps know and we’ll be able to help you find exactly the pumping system for your needs. The pump included with the UltraSump backup system is a DC-operated battery-powered UltraSump Pump, which matches the reliability and hardiness of the primary pump, and draws from a large, powerful battery power source instead of relying on mains electricity. This means that in the event of a power failure or loss of supply (or even a simple accidental unplugging) the UltraSump’s ability to pump is not compromised. On a fully-charged battery, the backup UltraSump pump can pump 11,000 gallons (41,639L) of water at a rate of 2,000 gallons (7,571L) per hour, providing more than enough time to bring your primary SuperSump pump back online while averting potentially costly flood damage. As soon as the power supply is restored, the smart charging system included with the UltraSump pump station kicks into gear to recharge the battery, getting ready for the next potential power outage. In addition to providing a redundant option when the power is lost, the completely separate pump in the UltraSump system means that the system is protected against mechanical failure as well – if the primary pump still has plentiful access to power but suffers a blockage or other issue and ceases to function, then the second pump is still fully capable of activating and pumping away potential floodwaters before they can cause a problem. Since a sump pump is your last line of flood defence in your basement, the peace of mind granted by the automatic SuperSump with UltraSump Backup really can’t be underestimated – freeing you up to deal with other issues or even working when you’re away from your basement and unable to take any action of your own. You won’t have to – your SuperSump pumping system with UltraSump Backup will automatically take that action for you. 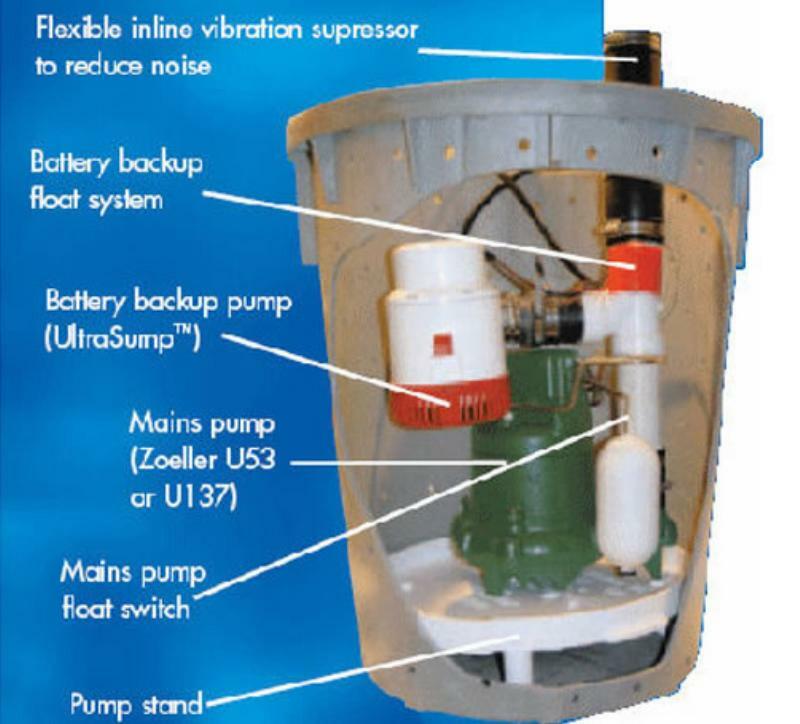 The SuperSump and UltraSump combination is housed in a sturdy, well-designed polyethylene tank, equipped with holes for water to flow in and attachment points for an airtight lid, two rubber fittings to reduce vibration on the pump outlet pipe, and an interior “pump ring” which keeps the pump assemblies separate and stops the float switches of the two pumps from catching on the walls of the SuperLiner when in operation. Well-suited to housing both SuperSump and UltraSump pumps, the SuperLiner is large enough to enclose both of them, while still providing enough space for their float switches, inlets and outlet pipes, and other components to operate at full capacity. Made from durable, high-quality polyethylene, the SuperLiner tank is resistant to all forms of corrosion, won’t suffer damage from exposure to water (even over the course of years) and won’t allow water or other substances to permeate through it. This makes the SuperLiner a great long-term choice for your basement sump, as it ideally won’t ever need maintenance or replacement! Anyone who has had a sump without an airtight lid will appreciate that it is far from ideal – odours, gasses, evaporated moisture and unfriendly insects can all rise up out of the sump, and tools, laundry, other goods and even children can fall in. With the patented Airtight Lid included with the SuperSump/UltraSump combination pumping station, you don’t need to worry about any of these problems any more. The airtight lid stops anything from falling in, while a drain with an integral floating ball valve allows water to drain into the tank while stopping air, radon gas or other unpleasant gases from escaping. The lid is strong enough for a person to stand on, guaranteeing that no storage space is lost to the sump, and the integral drain means that any sudden flooding – for example, from a burst pipe, is transferred to the sump and pumped away rapidly. An additional convenience of this airtight lid is that it comes in two halves, ensuring that the pump’s user can always access the pumps inside the SuperLiner, to perform any necessary maintenance or inspections, clear blockages or removing silt and sediment, while still stopping moisture and odours from rising into the basement. The lid is also a considerably tidier, neater-looking cover than an uncovered sump, and helps to protect the market value of your home. So Where Does the UltraSump Come In? A sump pump is a crucial piece of equipment for preventing a potentially costly flood in your basement – so failure of the pump would be a disaster. The UltraSump, which comes as standard in this configuration, helps to prevent that exact scenario, by providing a second pump and independent power supply which can take action if the primary pump fails. With a different pump and different power source, the UltraSump pumping system uses a mechanical float switch to detect when the water level has risen beyond the point where the SuperSump would normally switch on, and activates to pump away the water before a flood can occur. The power supply for this secondary pump is a large, powerful and long-lasting 120-amp battery pack, which includes an integrated “smart” charger for ensuring an excellent charge at all times, and automatic recharging in the event of use. This battery is specially designed for long-term standby operation, and is always ready to step up to the plate in an emergency. In the event of power loss, the UltraSump’s battery pack powers the secondary pump, which can pump away 11,000 gallons (41,639L) of water at a rate of 2,000 gallons (7,571L) per hour on a full charge, providing plenty of time for the primary pump to be restored to action. The UltraSump battery charger automatically recharges the battery once power is restored. The UltraSump Pump is a DC-operated pump, driven by its paired battery and activated by a float switch which automatically switches it on when water levels become too high. The battery provides enough power to pump away 11,000 gallons (41,639L) of water at a rate of 2,000 gallons (7,571L) per hour, but for added peace of mind, you may wish to order the additional UltraSump Battery Switcher, which allows the connection of an additional battery, doubling its operating time and total pumping capacity for unmatched emergency performance – ask the team at JT Pumps about this feature! 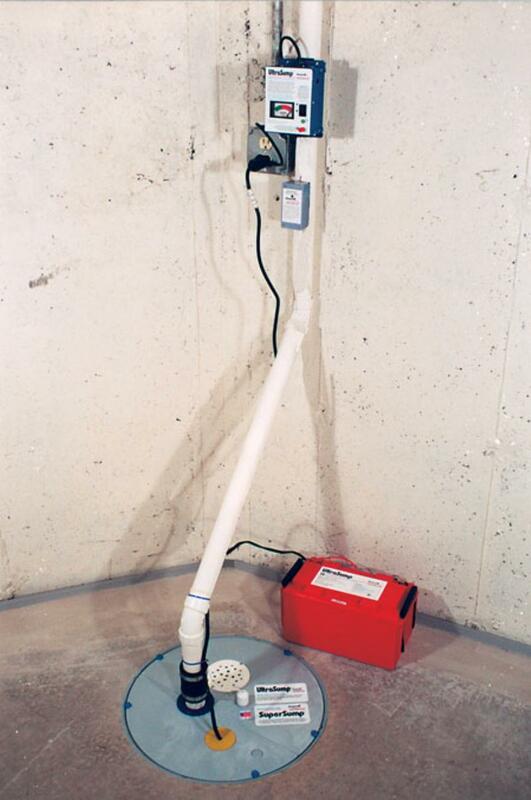 When all else fails, you certainly don’t want it to go unnoticed until it’s too late – that’s why, even when you’re using a sump pump system with a reliable, powerful backup pump, you’ll want a warning system if the unthinkable should happen. This warning system is the WaterWatch Alarm, which sounds off like a fire alarm when the water level rises too high, indicating that the pumps are not operating and alerting you of the danger in time to respond to the pump inactivity and avert a potentially damaging flood. If you would like to know more about the SuperSump/UltraSump combination sump pumping system from JTPumps, you can get in touch with our team at any time by calling on 0844 414 5800 or by using the contact form on this site to send us a message. Our expert team will be happy to provide any information you may need to make the best possible decision for your basement sump pumping needs, and can answer any questions that you may have. Call us today!